Peonies in the middle of winter? I couldn’t believe my eyes when I found these beautiful peppermint peonies in my local grocery store! I grabbed every bunch and took them home to arrange for a special guest who was coming for a visit. The guest room smelled wonderful—hope you enjoy them, too. Wow! The grocery in the mountains or in ATL? Such a beautiful bouquet…. Cindy, It was the grocery store in tiny little Cashiers, N.C.! 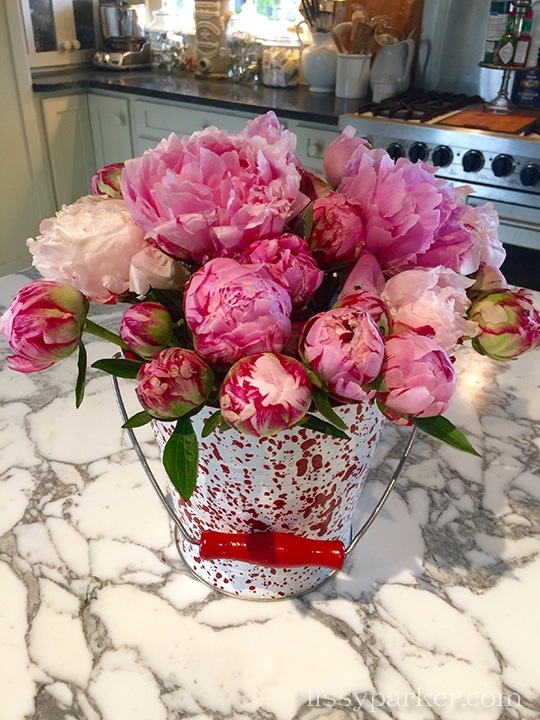 Those Peonies are gorgeous and one of my favorites. And pink ones love, love, love pink! Thanks for sharing! I understand fleurs were for a very special houseguest!! They are my favorite too—and they last soooo long.